Even though our planet is disproportionately covered in water, the species that seems to have the most mental ability it man, this is fairly obvious. What isn’t as obvious is that we didn’t get to be the smartest on the marble as an adaptation to be better than our competition. According to Suzana Herculano in this TED talk, the reason we made the jump in intelligence has to do with calories, and more importantly, how to get them. She says that a Gorilla’s brain has approximately 30 Billion neurons compared to us with around 86 Billion, and although the big apes spend most of their time (almost 9 hrs) eating they simply cannot get enough calories to feed more hungry neurons. 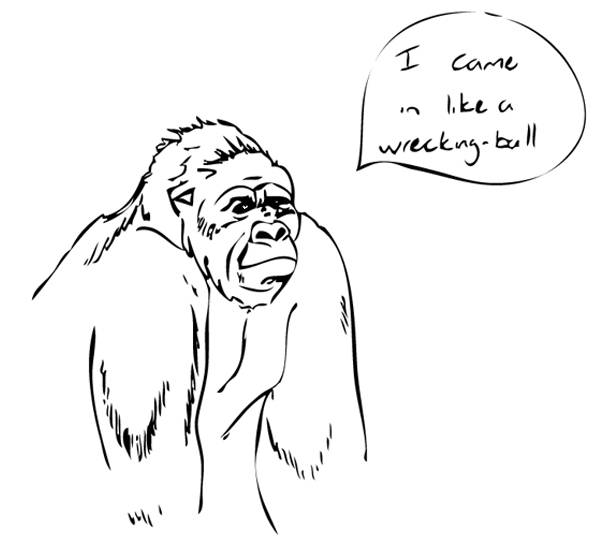 In order for the species to survive Gorillas chose brawn, over brain because they couldn’t eat enough. In other words: raw food would have kept mankind dumb. That being said, we weren’t much better if you consider that for the most part humans scavenged and ate what they could. That was until we figured out how to cook our food, which made it easier to eat, and gave us more calories than uncooked food, which in turn enabled us to have more neurons. There are many factors in our arriving where we are today, from opposable thumbs, domestication of livestock and crops, and intelligible speech, but it is fairly certain that those factors would not have been utilised as efficiently had we not had the brain power to back it up. So cook something, and as you chew on the succulent deliciousness give a moment of thought that without this simple thing we would probably not be here.